Posted on Sat, Oct 22, 2011 : 5:02 p.m.
Pittsfield Township residents will have the opportunity to enjoy a new greenway after the snow thaws this winter. Work along the last mile-long stretch of the Lohr-Textile Greenway is under way, and officials are hoping to have a ribbon cutting sometime in spring 2012. When complete, the 2.5-mile, 10-foot-wide non-motorized path run south on Lohr Road from Ellsworth to Textile Roads. It will then continue on the south side of Textile, roughly a half mile to Teft Park. Among the neighborhoods it connects are Stonebridge, St. James Woods, Waterways, Silo Ridge, Lohr Lake Village, Mallard Cove, Sha Estates and East Horizons. 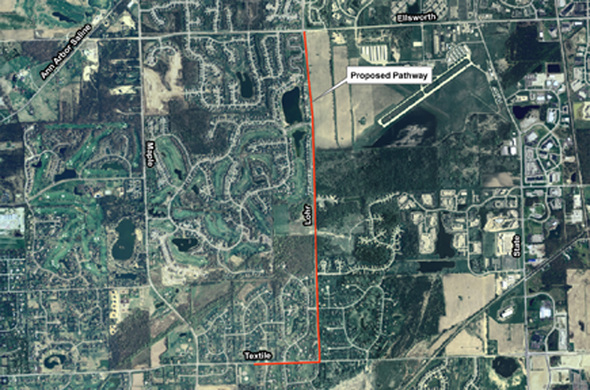 Township officials have said it is first project in a larger effort to develop an easily accessible network of non-motorized vehicle and pedestrian pathways linking Saline, Pittsfield Township and Ann Arbor. The about $1 million pathway was paid for by $800,000 in grant money and $200,000 in matching funds from the township, Township Supervisor Mandy Grewal said. “I think the comments that we’re getting from residents are overwhelmingly positive,” she said. My ‘Kodak moment’ was when we first started work on greenway and there was just a clear cut, dirt stretch. The project was met with some concern from residents who now have the pathway running through their front yards. But Grewal said the township worked with those residents and held multiple public meetings to discuss concerns over the project. The township was able to receive easements on several properties where the greenway cuts from the right-of-way next to the road up into residents’ yards. Easements were requested where there was concern the pathway might damage drainage systems, old trees blocked the path or there were no public right-of-ways in place to begin. The township also was able to reach an agreement with residents at 1821 West Textile Road who didn’t want the path running through the middle of their yard or their 100-year-old oak trees to have to come down. Grewal said the path in that location runs through the township’s right-of-way and several of the trees ended up having to be removed. The township also was forced to only use the right-of-way next to the Ann Arbor Airport. The Ann Arbor Airport Advisory Board told Grewal that they wouldn't approve an easement because the township opposes the runway expansion. Concerns the township heard during the planning process included the need for more pedestrian crossings, and more have been added, Grewal said. She added that the greenway remains in compliance with federal and state regulations, and the pathway includes a two-foot shoulder on each side. Additionally, adjustments were made to crosswalk designs and pedestrian direction at the request of homeowners associations in Lohr Lake and Stone Bridge subdivisions. Mon, Oct 24, 2011 : 5:10 a.m. The original plans called for extensions on Textile east of State Road and west of Maple Road. When can we expect these to start construction? Also the Platt Road Greenway was proposed to run south and east all the way to Rolling Hills. Sun, Oct 23, 2011 : 4:18 p.m.
AnnArbor.com, can you please print the Ann Arbor Airport Advisory Board letter to Pittsfield Township? It sounds like there is a story in there, and I would like to see some light shed on it. Sun, Oct 23, 2011 : 3:33 p.m. I agree with the other posters that this pathway is great! Another home run hit by Pittsfield and Mandy Grewal. Here's to hoping that it is just the start of a broader plan to get all township residents connected to their parks by bike/walking paths. The Platt Road greenway is another fabulous project that I use often, so I hope they can somehow link both of these together. The township has done a nice job on both projects. I'd also say 'get lost' to the airport board. Sun, Oct 23, 2011 : 3:05 p.m. I live close to the pathway. I can only see it enhancing property values. It provides a safe method for recreation for multi-use options, especially on Lohr Road which has no posted speed limit. The township did a nice job to make it as natural as possible. I would hope it leads to linking the path to a safe way to get into Ann Arbor for non moterized methods. Sun, Oct 23, 2011 : 1:10 p.m.
Glad we citizens of Ann Arbor have a greenbelt to protect us from the township's greenway. Sun, Oct 23, 2011 : 11:11 a.m.
As a runner, I love the new pathway/sidewalk! It is so much safer than having to share Lohr Rd with cars. I've used it many times throughout it's construction and appreciate the efforts prevailed by the people involved in making it a reality. Thanks! Sun, Oct 23, 2011 : 6:38 a.m.
Love it, Love it, love it. Thanks PT It's better and nicer than anything I could have imagined - in my mind anything that encourages people to get outside and exercise is a good thing. Sun, Oct 23, 2011 : 4:06 a.m.
Nice work from the Township. It couldn't have been easy coordinating all the interests involved. Great addition. Probably the City of Ann Arbor's obstruction on this will put the final nail in the airport runway expansion. Sun, Oct 23, 2011 : 12:08 a.m. Very sad to see the petty people at the airport blocking an easement the way they did. The letter they sent to the Township will be preserved as an illustration of how petty and small they are. Then again they have always acted selfishly so this shouldn't surprise anyone. They have certainly created a larger population of people who oppose anything the airport plans to do in the future. Nice move; don't be surprised to find a lot more opposition to anything you want to do in the future. Himjo - it's a 10 foot wide 'sidewalk', huh? I'm more accustomed to 5 foot sidewalks. Good bye AA Airport, hello bikeway! Nice job Pittsfield Township. Let's get the City of Ann Arbor stuff out of our community if all they want to do is block, obstruct and pollute. You obviously never read the letter from the airport to Pittsfield (ask Mandy Grewal to see it) - it was simply an extortion request. And: read the environmental assessment offered by the airport (or was it AV Fuel) - flawed and full of errors (e.g. there are no geese flying around near the airport) and it had to be rejected by the state and federal authorities. It's a two way street - you're right and now Pittsfield is going to show that when you have facilities in their town there are consequences. I suspect each application from an entity of AA in Pittsfield will be reviewed and challenged. Thanks to the airport. Sun, Oct 23, 2011 : 12:39 a.m.
&quot;petty&quot;.... Property owners have rights. Just ask the people who live in Stonebridge. There is still the proposed State Road widening. This CAN'T be done without right of way acquisition. There will need to be some compromise between the City and the Township. The City can block the road project just as easily as the Township can obstruct the runway expansion. I guess we could do just fine without either project, but then what is the point of doing environmental assessments? Sat, Oct 22, 2011 : 11:38 p.m.
After being uncertain at first, this project is hands-down one of the better additions to public recreation I've seen a local government pursue in a long time. I live nearby and have seen residents using it extensively even before it was paved. Families are even walking together at night with flashlights during the nice summer evenings! Kids on bikes are now traveling to friends homes when previously they had to be driven. I think it weaves nicely through the areas and my neighbor friends that abut the greenway were even more pleasantly surprised by the result after it was put in place. I would think property values would go up for anyone in the area since this is a feature home buyers look for (more recreation and access to parks). This article fails to mention another part of the project is to add about 150 new trees along the route upon completion. I think Pittsfield did an outstanding job! We used to call this a sidewalk. Mon, Oct 24, 2011 : 12:14 p.m.
That was my thought. Most of the houses in town have &quot;non-motorized pathways&quot; in the front yards, and it seems to turn out fine. Sat, Oct 22, 2011 : 11:14 p.m. I can see some of the Good and Bad sides of this project and it won't be long before this thread is filled with strong opinions leaning for and or against. The Good: Safer for walkers and Bikers who would normally travel this way and for cars trying to avoid them A selling point for those wanting to live near this route who want this sort of thing Jobs for those building it to those maintaining it including snow removal for years to come It could make those living on or near it more likely to get out and get some exercise The Bad: The possible property value drop if it hasn't happened already for those who live right on it The loss of privacy and possible safety of those now living on or near it A clear path for those trouble making Saline Kids into Pristine A2 ( tongue in cheek of course for I am a once deviant saline grad and turned out ok). Hopefully this route will Not be infected with Crime and Predators but there is a lot of places to hide ( if you travel this route don't do it alone or without Mace, not fully tongue in cheek on this one ) The cost of it and now maintaining it Since I drive this way often, it does look out of place and crappy in some areas at the moment, maybe it'll grow on me and others?